Florida is known as a tourist-friendly state, but starting Aug. 1, one visitor will no longer be welcome: the invasive lionfish. Introduced into Florida waters in the late 1980s, lionfish populations have boomed in recent years, negatively impacting native wildlife and habitat. 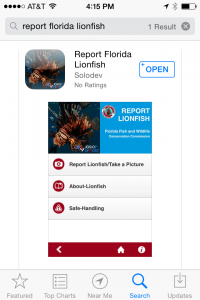 Several management changes go into effect Aug. 1 that will help the Florida Fish and Wildlife Conservation Commission (FWC) combat the growing problem by making it easier for lionfish hunters to remove the spiny predators and limiting further introduction of the species into the waters. Florida’s new Lionfish Reporting App! – image courtesy FWC. 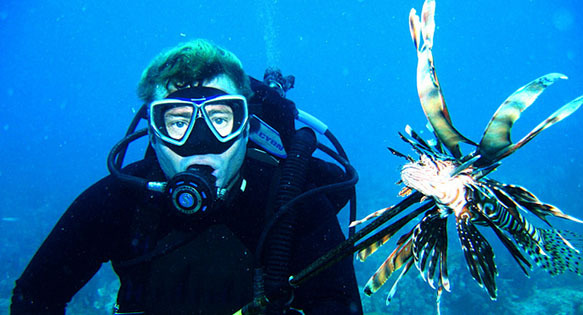 Allowing participants of approved tournaments and other organized events to spear lionfish or other invasive species in areas where spearfishing is not currently allowed (such as certain state parks or refuges). This will be done through a permitting system. Note from Reef2Rainforest.com – we’ve posted three full excerpts from the July/August 2014 issue of CORAL, including “BANNED” and our July/August 2014 CORAL Editor’s Page, and “Can I Keep My Lionfish?”, which provide additional and specific information on the forthcoming ban covering lionfish from the genus Pterois in Florida. Additionally, new commentary from livestock suppliers, featuring Kevin Kohen, director of LiveAquaria.com, provides insights into how livestock suppliers are preparing for a ban which directly impacts their businesses and customer base in Florida! Can't Keep Your Aquatic Pet?